Those of you who are regular readers will know I am a bit obsessed with books. For as long as I can remember, I've always been a keen reader, and I love being able to disappear into another world or find out something new in amongst the pages. So when I spotted the Bookworm Tag on the lovely Gemma's blog Lipsticks and Lashes, I thought it was absolutely perfect for me, especially as I haven't done a tagged post for a while. So without further ado, here are my answers! I was always into books right from when I was little - I remember not being allowed to open books first at birthdays or Christmas because I'd just sit there and read them, and my mum had to hide books I was taking on holiday or I'd read them all. I do a lot of my reading on the bus to work - often with the train I'm so wedged in that it's difficult to position myself to read my Kindle, whereas on the bus I can usually get a seat and spend the journey happily reading. I also like to read in bed, either before I go to sleep at night or at weekends when I first wake up. One book at a time - I think if I tried to do more than one at once I'd get it all mixed up in my head. I like a bit of everything, but if I had to pick a favourite it would be modern or historical fiction. I also tend to like things with a bit of a supernatural twist. It's got to be The Time Traveler's Wife by Audrey Niffenegger, which I reviewed for the #2014BloggerChallenge here. I love the combination of the relationship between Clare and Henry and the slight fantasy element. Apparently there is a sequel coming soon too which I'm very excited about! The only two books I've really struggled with are Doctor Zhivago and The Silmarillion. But I am stubborn and will keep coming back to a book even if I don't like it because I can't leave it unfinished! I wasn't keen on Oliver Twist either as it's so relentingly bleak. If we're counting all three volumes as one book, then The Lord of the Rings by a country mile. That said, I'm currently doing a Charles Dickens Challenge and he has some books that are well over 800 pages long, so it'll probably be more than that by the end of the year! As in actually paid for money for? Oliver Twist - the grand total of 49p on Amazon. I'm very close to the end of Nicholas Nickleby and once I've finished that will be starting on Falling Leaves by Adeline Yen Mah. Not that often to be honest, although I have pre-ordered Dreams of Gods and Monsters, the last one in Laini Taylor's Daughter of Smoke and Bone trilogy which is coming out in April. I loved the first two and am ridiculously excited for Dreams, but also really sad that I'm going to be leaving these characters behind! It varies wildly - sometimes it can be up to six, if I'm going on holiday for example, and at other times I can buy none if I get lots of free classic novels on my Kindle or (as happened recently) a friend offloads a heap of their books onto me. But on average it's about two or three. I kind of think of them as the book equivalent of Primark and H&M; you have to sift through the rubbish (in this case multiple copies of The Da Vinci Code and Fifty Shades of Grey) to find the gems, but when you find something good it's worth all the effort. Do you keep your read and to-be-read books together? 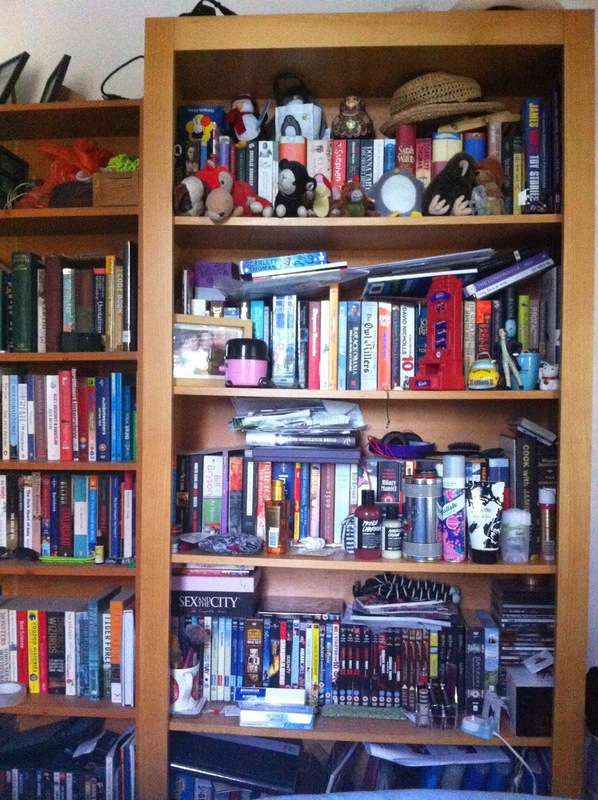 No - my read books live on my bookshelf but my non-read paperbacks tend to live in a pile on the windowsill in our room. For the Kindle, I tend to only buy new books when I've finished the old one, but they are kept together if I've bought lots of new books in one go. Of course! I can't imagine buying books I wouldn't actually read - does anyone seriously do that? It depends where I got them from - the Kindle books stay on there (though will get shifted to The Cloud when I eventually run out of space), books I was bought as presents get kept, and books I bought myself go to the charity shop or on PlayTrade. All the time - I regularly give unwanted paperback books to the charity shop or to friends. Not intentionally. I'm not buying books at the moment (well beyond my Charles Dickens Challenge books, but they rarely cost much more than a few pennies) but that's because I got a big load of books when my best friend moved out of her flat and asked if I wanted any. I don't think I could ever go long enough to have a book buying ban - it just feels wrong to go anywhere without a book with me. Let me know if you do this tag, I'd love to see your answers!